Your kind of music. Your kind of musical. For five years, Beautiful, the Tony and Grammy Award-winning Carole King musical, has thrilled Broadway with the inspiring true story of one woman’s remarkable journey from teenage songwriter to the Rock & Roll Hall of Fame. From the string of pop classics she wrote for the biggest acts in music to her own life-changing, chart-busting success with Tapestry, Beautiful takes you back to where it all began—and takes you on the ride of a lifetime. Featuring over two dozen pop classics, including “You’ve Got a Friend,” “One Fine Day,” “Up on the Roof,” “You’ve Lost That Lovin’ Feeling,” “Will You Love Me Tomorrow,” and “Natural Woman,” this crowd-pleasing international phenomenon is filled with the songs you remember—and a story you’ll never forget. 'Beautiful' is a joyous celebration! Douglas McGrath's smart, well-crafted, and funny book cleverly threads together a memorable catalog of early rock hits. Carole King fans will love it! With Marc Bruni's crisp direction and Josh Prince's precision choreography, the song hits segue seamlessly on Derek McLane's grid set - from drab office to glittery concert stage - with the efficiency of one of librettist Doug McGrath's snappy lines. 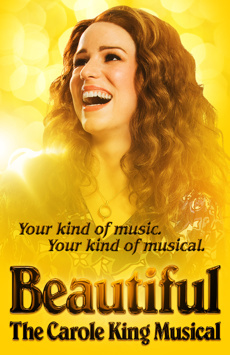 What Is Beautiful: The Carole King Musical Like? A treasure trove of great music combined with an inspiring story in which the heroine emerges triumphant, Beautiful showcases classic hits such as “Natural Woman,” “Up on the Roof,” “Take Good Care of My Baby” and “You’ve Got a Friend.” This is not a glorified concert, however: The songs are performed in a theatrical context that helps illuminate Carole’s rise from shy teenager to loving wife and mother to international star. Oscar-nominated screenwriter Douglas McGrath emphasizes the friendship of King, Goffin, Weil and Mann in his smartly funny libretto. You don’t have to be a Carole King fan to love Beautiful, but you’ll certainly leave the theater with a fresh appreciation of the woman and her accomplishments. 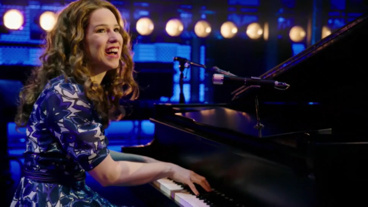 Is Beautiful: The Carole King Musical Good for Kids? Beautiful is appropriate for the entire family, but very young children won’t be interested in this 1950s-era biography. The show is best for pop music lovers age 10 and up.